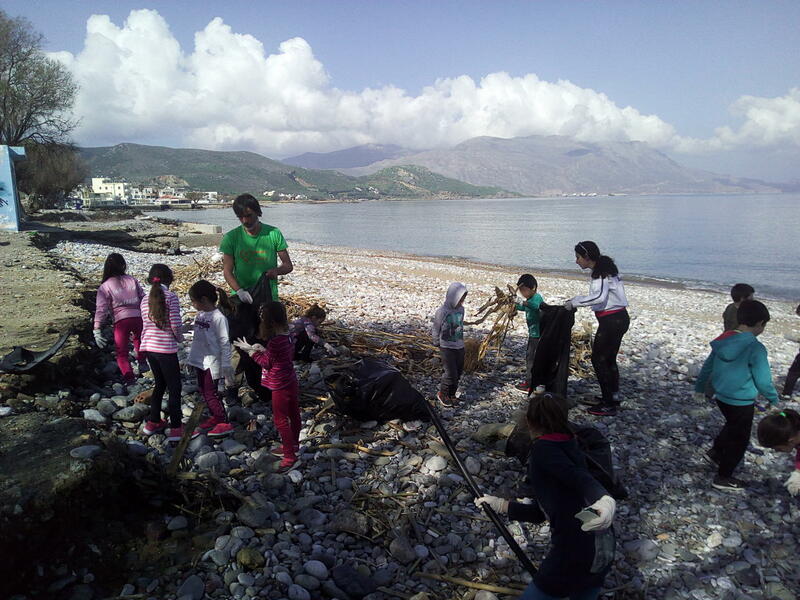 On Thursday morning, in collaboration with their teacher and headmaster, some volunteers from the Kissamos Beach Cleaning team took the 1st year class from one of the primary schools in Kissamos to the beach for a morning of environmental education. The volunteers, the teacher and the children talked about the natural environment, what it is and what good actions we can do to conserve it. Things were kept accessible to little 6 year old kids. Then the group put some of that into practice and proceeded, all together, to clean the beach from some of the rubbish lying around after the latest storms. The kids were extremely good and caring, and surprisingly effective cleaners! Quite a few big bags were collected in a very short time. After that, the team spent a little time analysing what they had collected and the different types of waste. Finally, the discussion was closed with a few words about volunteering and doing things for the common good. The kids came up on their own with great answers to ‘morally complex’ questions about the natural environment and great suggestions for how to make matters better. Impressive.